On a dewy morning, we were all forced to wake up before the sun appears. Ooppss…did I say force?? 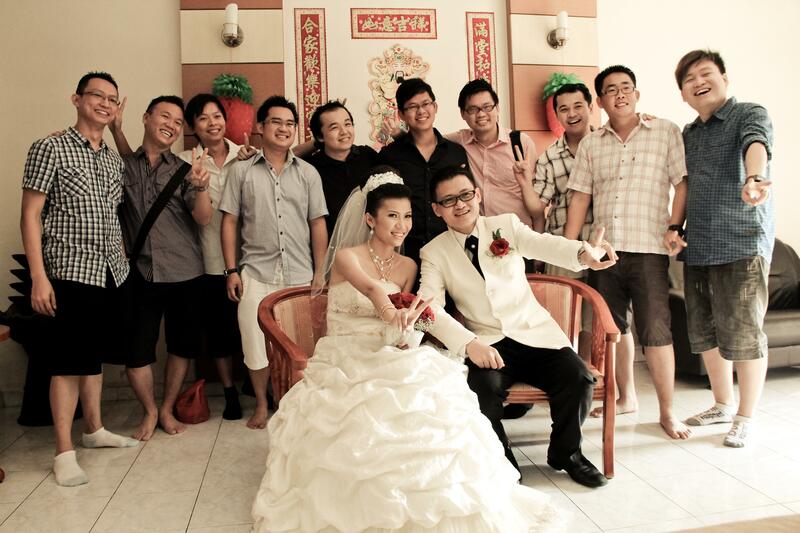 Hehe….Everyone of us got ready by 7am to reach Han’s house as early as we could. 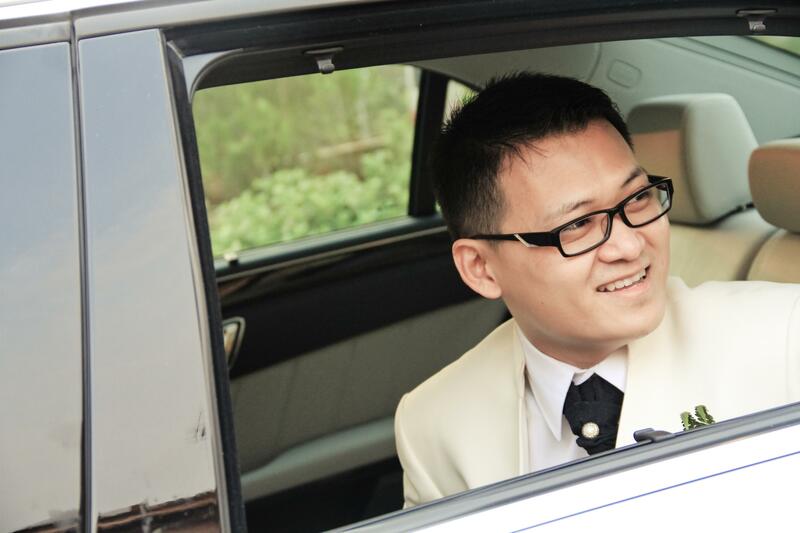 Han (the groom), marked 25th September 2011 as an important and memorable date – THE WEDDING DAY! 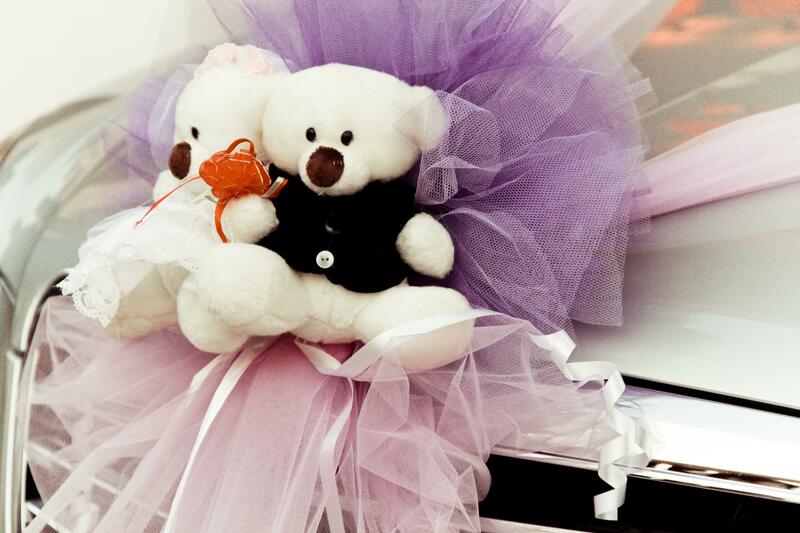 The well decorated bridal car together with a pair of wedding bear. 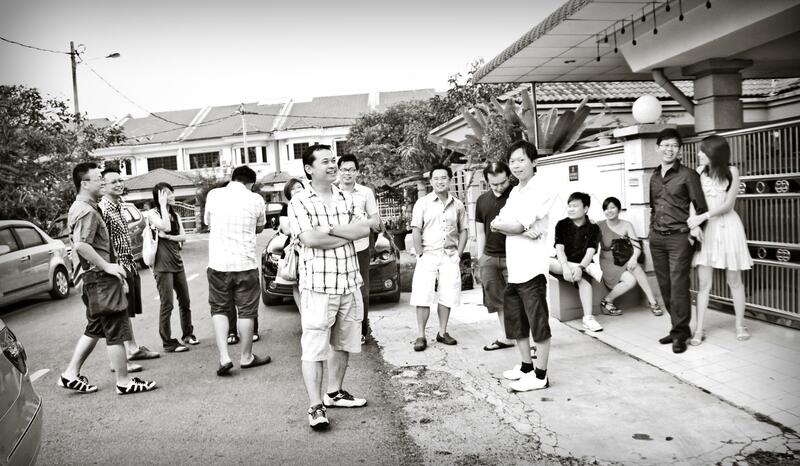 The ‘seluar pendek’ gang/heng tai/brothers are all ready to fetch the bride. We were so punctual. Somehow, nobody dare to enter…. afraid? 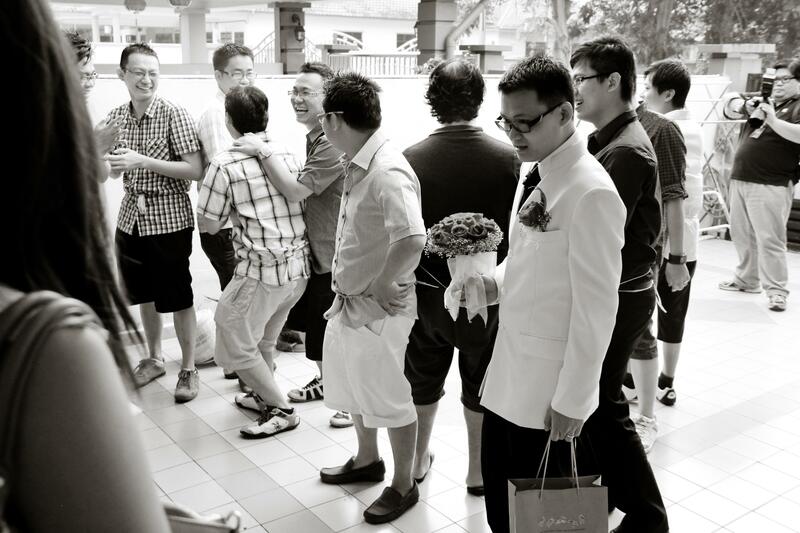 shy?…..
“Han : Guys…you all can go in oledi wan….” Despite been ‘ordered’ by the groom, yet no one bothers…hahaha…. The girls (bride’s friends) were all ‘waiting’ at the front door. 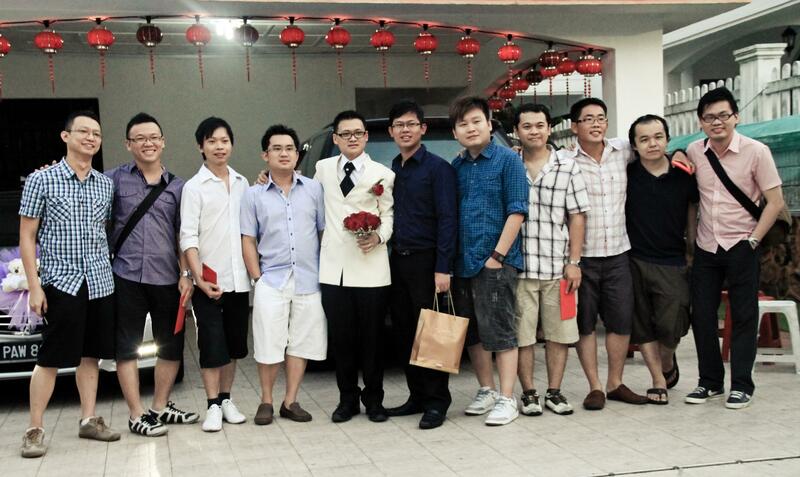 Prepared with all the tasks/’game’ for groom & his fellow heng tais. Those days, groom brings gifts of cash, wrapped in red packet, to give to his bride’s friends, in exchange for ‘letting her go’. These days, its getting tougher. 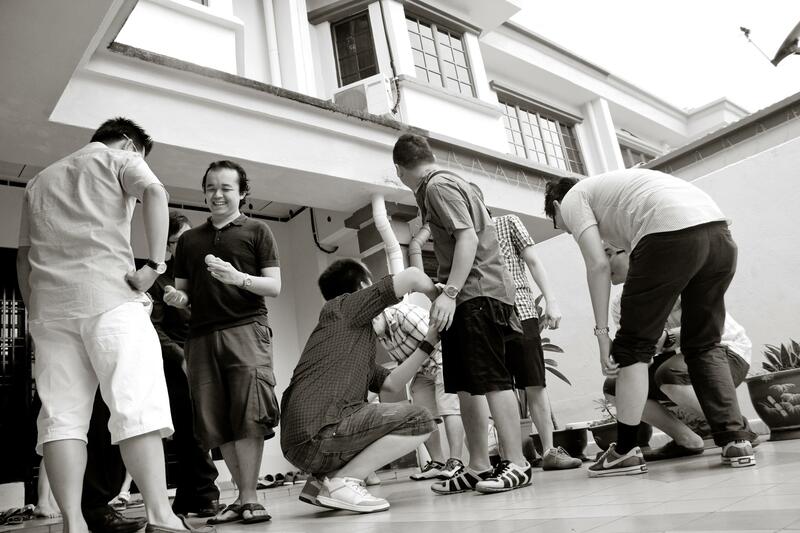 The groom and his heng tais gotto complete all ‘wedding door games’ planned by the bride’s friend in order to get the green light to fetch the bride – so that the groom will appreciate the bride wor…..
Haha…looks like the guys were having big headache. 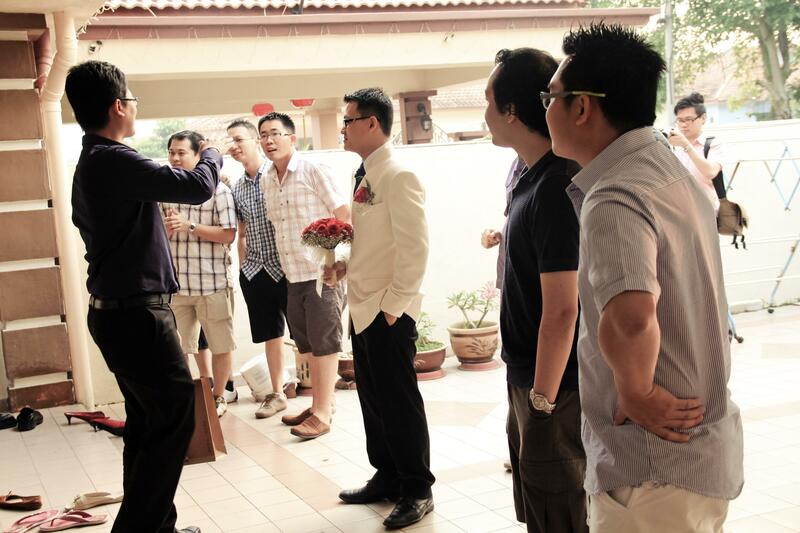 Jimmy, the best man was busy instructing the rest. Started with the 1st task. 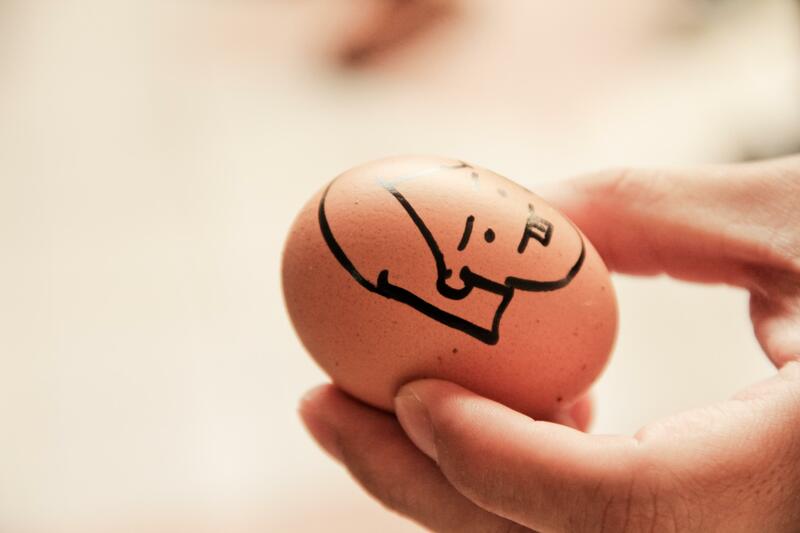 Hmm….1st task has to do with egg. What are they doing?? They were told to get a partner, then roll the egg under the pant and you are not suppose to break the egg. continued with 2nd task before these guys are allowed to enter the “1st door”. They were told to work in pair. Peel and eat your partner’s banana using mouth! 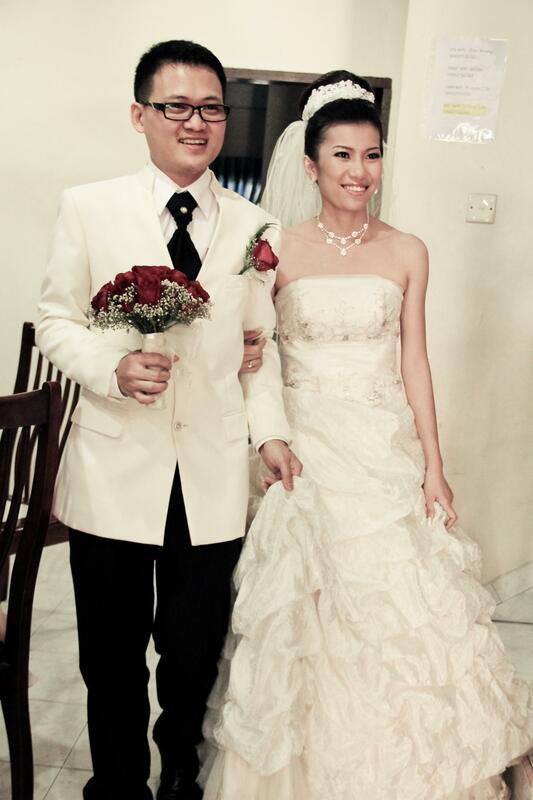 After some questionnaire and singing session…Han finally fetched his beautiful bride, Sok Kuan. 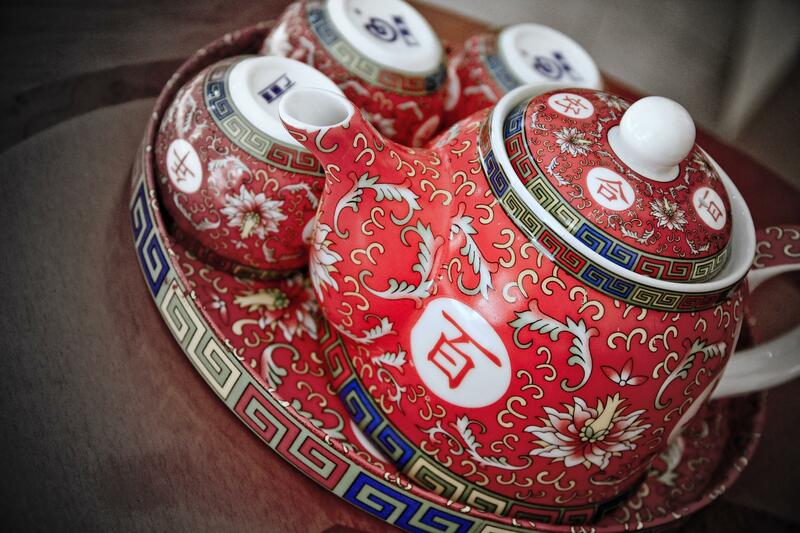 In Chinese wedding, tea set is a meaningful keepsake of the wedding. 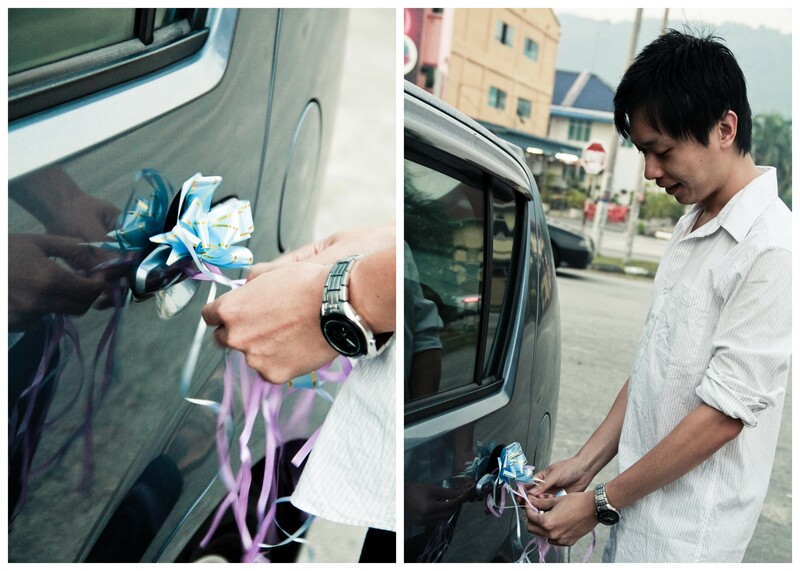 The bride will use it again when her own daughter gets married in the future. (Not many people will actually keep it for the next generation). Lotus seeds and two red dates are used in the tea for two reasons. First, the words “lotus” and “year,” “seed” and “child,” and “date” and “early,” are homophones, i.e. they have the same sound but different meanings in Chinese. 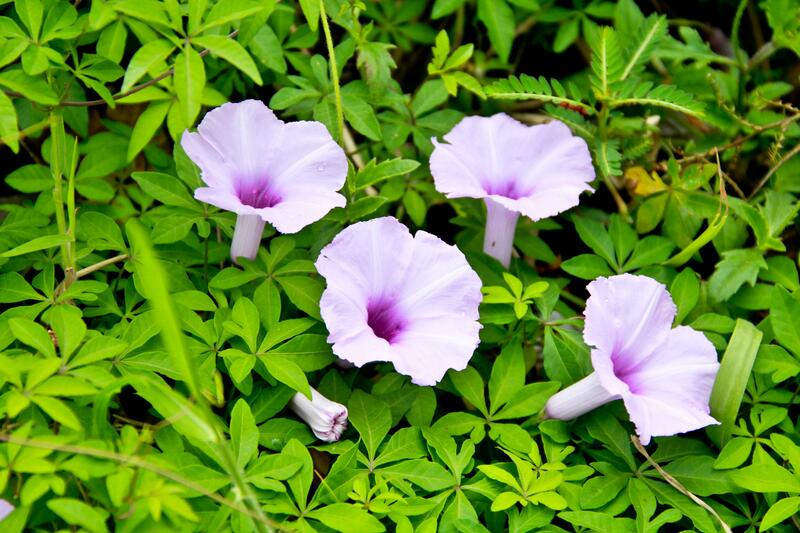 Secondly, the ancient Chinese believed that putting these items in the tea would help the newlyweds produce children early in their marriage and every year, which would ensure many grandchildren for their parents. 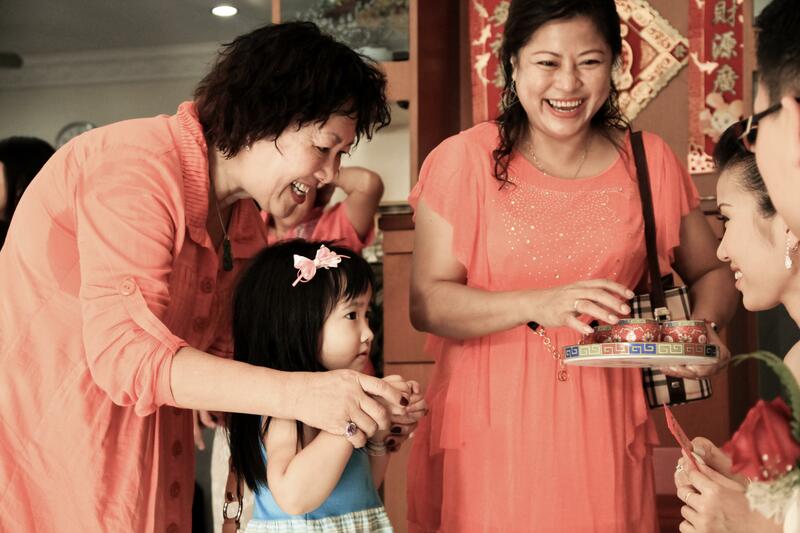 Also, the sweetness of the special tea is a wish for sweet relations between the bride and her new family. 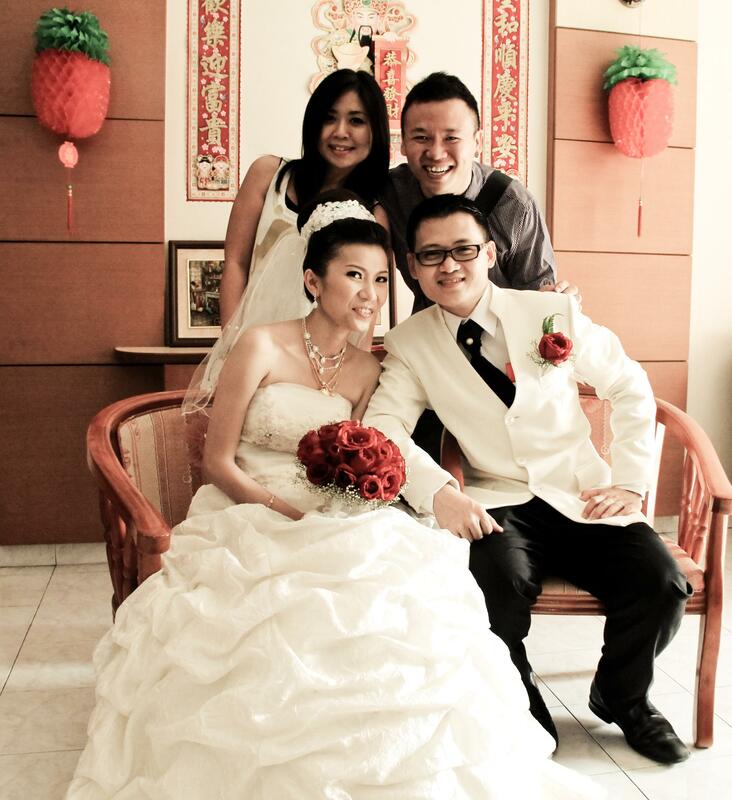 Its a tradition that bride & groom serves tea to their beloved parents. In order to show their respect. The people being served will sit in chairs, while the bride and groom kneel. For example, when the newlyweds serve tea to the groom’s parents, the bride would kneel in front of her father-in-law, while the groom would kneels in front of his mother. 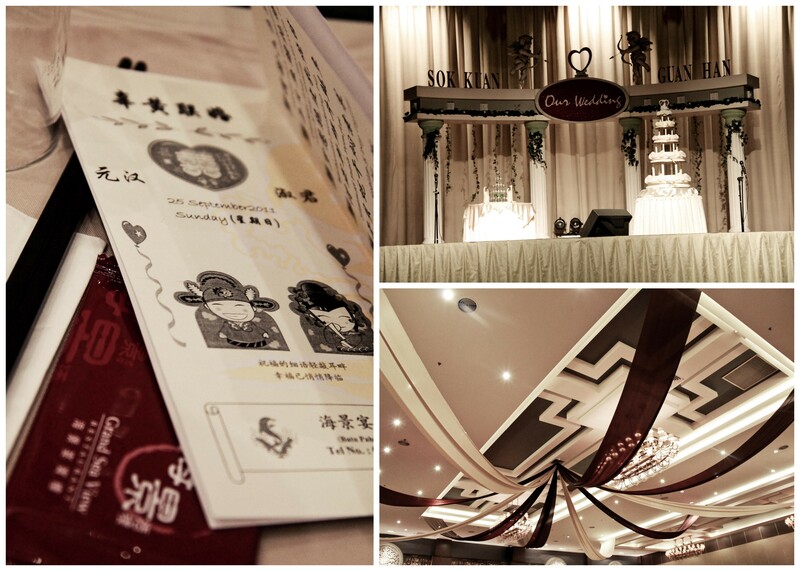 In return, the newlyweds receive lucky red envelopes (“lai see,” which means “lucky”) stuffed with money or jewelry. The younger ones get to serve tea to both bride & groom. In return, she will receive a red packet. 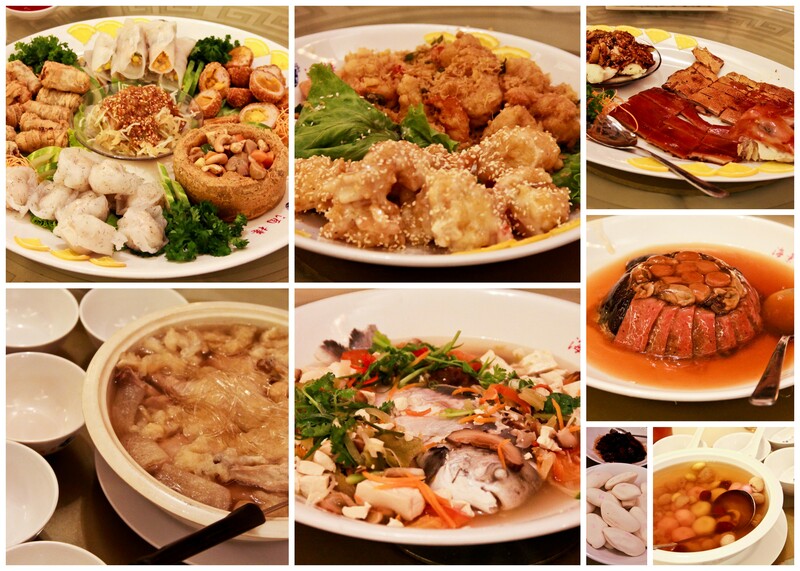 Fed each other with ‘tong yuen’. 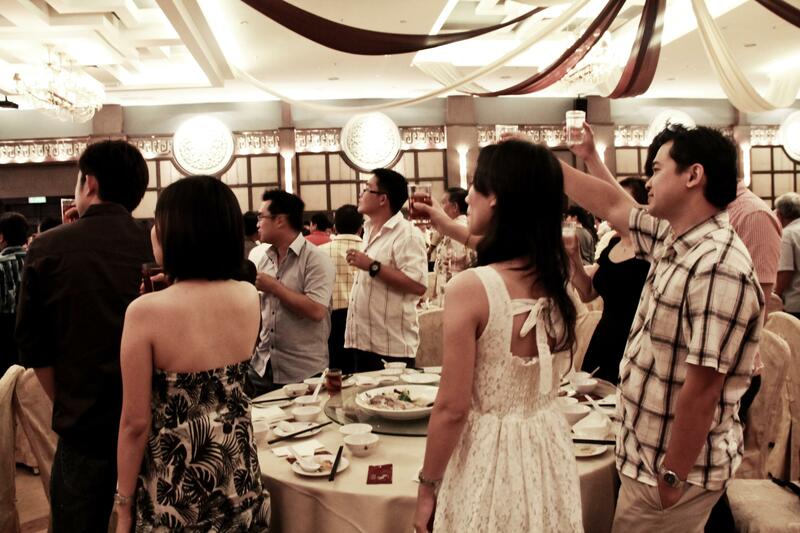 Eating ‘tong yuen’ during wedding meant to signify the start of a new wholesome, complete family. Bride leaving to groom’s house…shed with a red umbrella. Why uses a red umbrella? red umbrella over her head, meaning “raise the bark, spread the leaves.” While Other relatives will scatter rice, red bean and green bean on her. The red umbrella protects the bride from evil spirit, and the rice and beans are to attract the attention of the gold chicken. 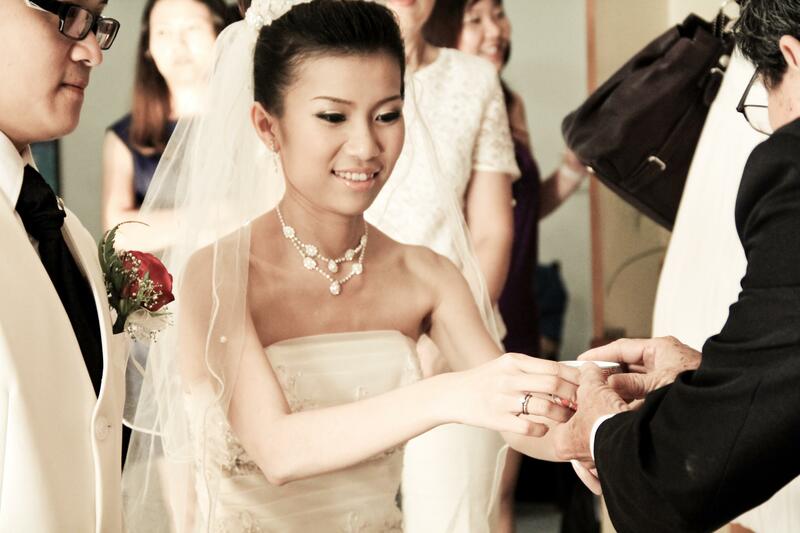 A beautiful smile from the bride. 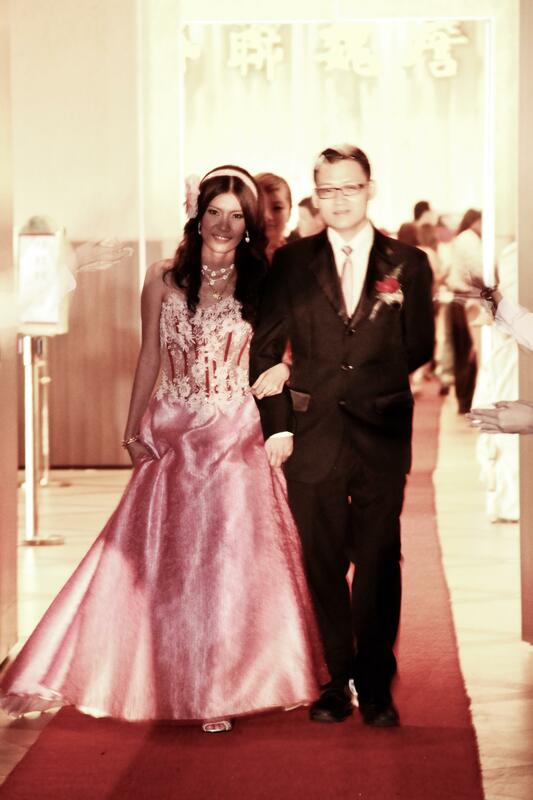 The joyous moment of a wedding couple is walking down the aisle. Lets yum seng!!! A toast to the newly wed. Wish them a blissful marriage. 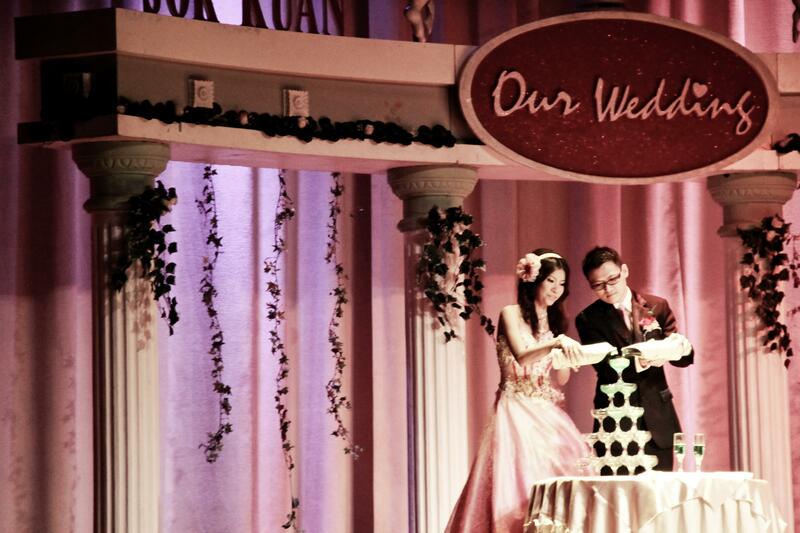 Once again, CONGRATULATIONS to Guan Han & Sok Kuan. CHEERS!!!!!!!!! wish them all d very best and congrats! !i love the way this pictures were taken.hats off to the photographer:) love to see chinese wedding!they are made for each other. Thanks Tammy….So, are you giving me a ‘hats off’?? hehehe…. Thanks for describing what all the things mean in the tea ceremony – learnt something new today! 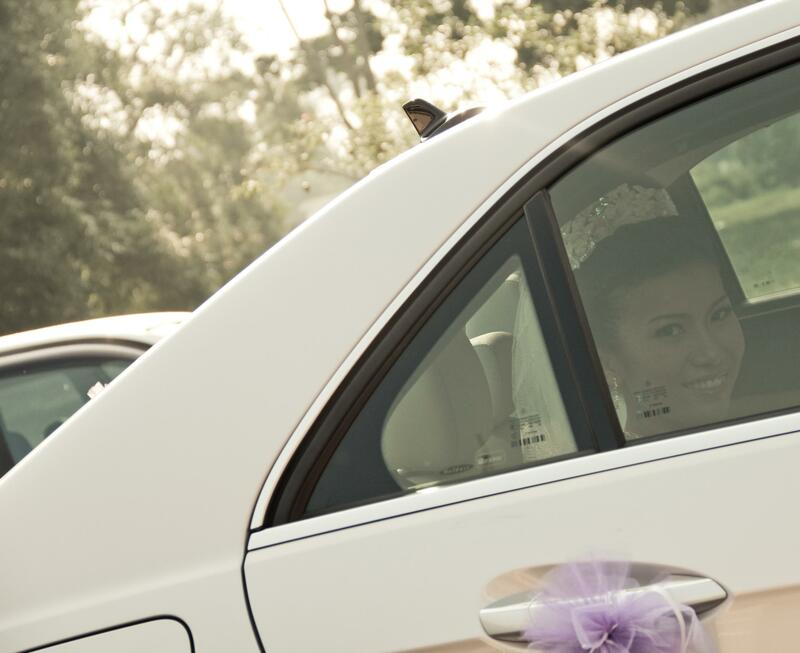 I love how Chinese weddings use stuff toys in wedding cars, when I lived in Hong Kong they use Hello Kitty a lot. Ahhh….I love hello kitty!! It will be very nice to use that….